It’s a surgeon’s dream. A device that can be implanted into the body that takes care of a given pathophysiological condition, and then simply fades away into the surrounding tissue without causing any toxic side effects or immune complications to the patient. The human body is designed to break down complex biomolecules using hydrolytic and enzymatic mechanisms. Bioresorbable medical devices exploit this property as they are made up of polymers that can be easily degraded by the body over a span of time. This overcomes common issues with current non-natural medical devices relating to their biological incompatibility, which can trigger toxic side effects and immune rejection. Indeed, the global interest in bioresorbable medical devices from researchers, clinicians, biotech giants, pharma conglomerates, and medical device companies is not surprising. 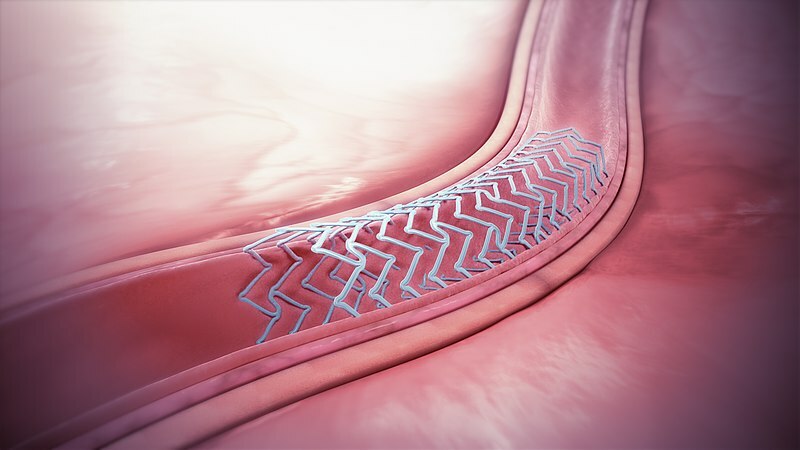 According to Grand View Research, Inc, a market research reporting and consulting firm, the global bioresorbable coronary stent market will surpass $247 million by 2025 — and this does not even include other markets where bioresorbable devices are increasingly being used to repair bones, deliver drugs, and aid in disease diagnosis. Bioresorbable osteosynthesis materials made up poly-L-lactic acid (PLLA), poly-DL-lactic acid (PDLLA), polyglycolic acid (PGA), or unsintered hydroxyapatite (u-HA) are increasingly being used for different types of oral and maxillofacial surgeries. These materials have seen immense success and popularity, particularly in Japan, where a number of products such as GrandFix, SonicWeld-Rx, LactoSorb, RapidSorb, and Fixorb-MX are currently being used for maxillofacial surgeries. Moreover, bioresorbable silk fibroin screws have recently been tested for fracture repair by researchers from Tufts University and show promising results in promoting bone repair. Future research on bioresorbable materials promises to yield several new and exciting discoveries. This optimism is reflected in a report by MarketsandMarkets, which projects that the resorbable polymer market will grow to $1.4 billion by 2021. Introduced in 2012 as an alternative to clinically problematic metallic stents, bioresorbable vascular scaffolds (BVSs) are designed to force open occluded arteries and restore blood flow. Composed of polylactic acid, these devices have been used to treat roughly 150,000 patients worldwide. Abbott’s Absorb BVS is one such system (see video) that received regulatory approval in Europe in 2011 and in the United States in 2016. The stent was designed as a drug delivering system, meaning that while increasing the diameter of the occluded artery, the stent delivers the immunosuppressant everolimus. It later integrates seamlessly with the coronary artery. Despite short-lived initial success, the device remained heavily scrutinized as a series of clinical trials in United States, China, and Japan showed conflicting data, suggesting that the device is not ideal for more complex lesions. Eventually, Abbott, a pioneer in the development of this technology, pulled the device from the market, citing insufficient sales. Although metal-based stents continue to do well, further trials are underway for bioresorbable stents, and it remains to be seen if they will withstand the regulatory gauntlet in the coming years. Meanwhile, DESolve (made by Elixir Medical Corporation of Milpitas, CA), ART Pure (by Arterial Remodeling Technologies SA of Paris, France), Magmaris and Fantom (both from REVA Medical, Inc. in San Diego, CA) are some other currently available bioresorbable scaffold alternatives. Bioresorbable stents can also be used to assist in suturing blood vessels. Researchers in the engineering department at the University of Nebraska Lincoln have recently tested bioresorbable “couplers” that can be used to hold the ends of an artery in place, providing a framework of support for conducting intricate surgeries that involve the suturing of blood vessels. Since the blood vessel size in individuals can vary, the team designed a method that allowed 3D-printing of couplers with varying diameters by using an ink containing an aqueous solution of sucrose, glucose, and dextran. Studies done in pigs showed that the sugar-based 3D-printed couplers could be used to cut down surgical time by at least three-fold and completely dissolved once the blood flow was restored. A prototype of the sugar stent developed by University of Nebraska Lincoln researchers, which helped accelerate the suturing of arteries in several recent experiments. Courtesy of the researchers. When Aldous Huxley wrote the famous futuristic novel Brave New World in 1932, he probably didn’t imagine that bioresorbable wireless electronic circuits would be in testing by 2018 to speed up nerve regeneration in rats. Indeed, researchers from Northwestern University have designed a coin-sized poly(lactic-co-glycolic acid) (PLGA)-based wireless device that can send out short spikes of electricity to damaged peripheral nerves and accelerate their growth, increase muscle strength, and facilitate functional improvement in rats. Fiber optics was a revolution that forever changed telecommunications, and recent advances could lead to its increasing use in diagnostic applications. Bragg gratings are optical devices that are frequently used in determining bridge tensile stretch and tracking airplane wing structural stability. 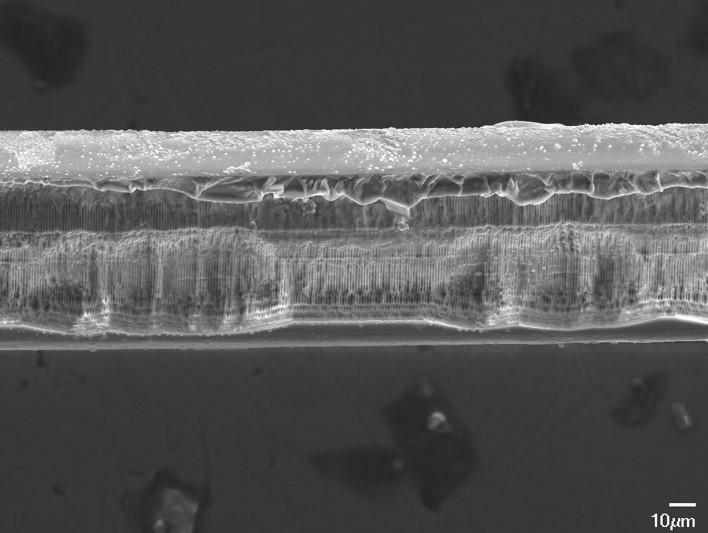 Researchers from the Institute of Electronic Structure and Laser (IESL) at the Foundation of Research and Technology in Greece have now tailored these devices such that they can be etched onto bioresorbable glass optical fibers designed from phosphorous, magnesium, calcium, silicon, and sodium oxides. If strategically placed, these bioresorbable optic devices could be used for monitoring bone fracture repair and pathologies within other visceral organs. Researchers inscribed a sensing element known as fiber Bragg grating into a glass optical fiber designed to dissolve completely inside the body. The image shows the side view of a bioresorbable fiber Bragg grating after it has dissolved in liquid. 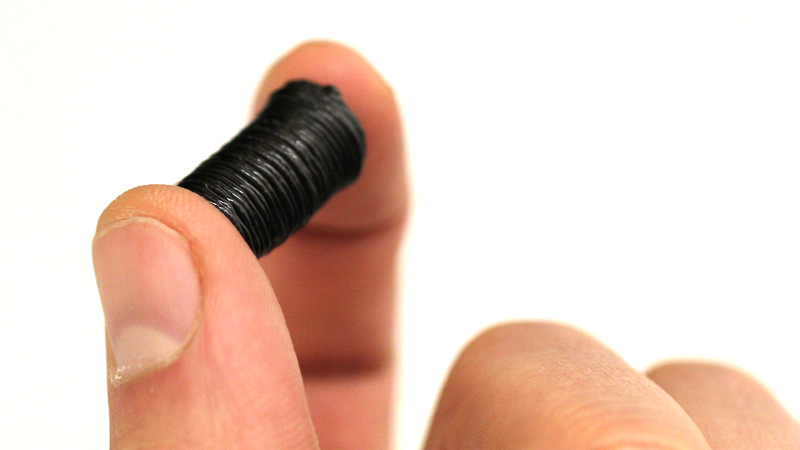 The gratings could be used as tiny probes that can safely reach and assess delicate organs. Source: Maria Konstantaki, Foundation of Research and Technology – Hellas. In addition to increasing the use of these devices in cardiovascular and orthopedic applications, rapid advances in bioresorbable device technology promise to herald a new revolution that could alter the way future doctors diagnose and treat diseases. Featured image source: Manu5 (CC BY-SA 4.0), via Wikimedia Commons. If you have any questions or would like to know if we can help your business with its innovation challenges, please leave your info here or contact Jeremy Schmerer, Healthcare & Life Sciences Lead, directly at jschmerer@prescouter.com. Vinayak Khattar completed his Masters in Biotechnology at D.Y. Patil University, India. 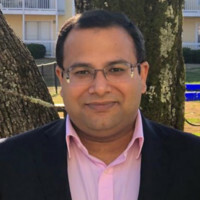 He received his Ph.D. in Cancer Biology at the University of Alabama at Birmingham (UAB) and then completed his M.B.A from the Collat School of Business (UAB). He is passionate about marketing, developing, and communicating life sciences-related business ideas. His research interests lie in identifying mechanisms that dictate protein stability in cancer cells, immuno-oncology, and bone biology. He is a skilled scientific writer with cross-functional expertise in Molecular Biology and Cell Biology with a broad knowledge in 25+ biotech and business subjects. He has successfully completed many projects leading to 7 peer-reviewed publications, 40+ citations, and 3 awards. He has contributed 25+ research-news style articles as a freelance medical content writer for Medical News Bulletin – a Canadian organization that disseminates research and medical advances to lay audiences. Vinayak likes to watch Netflix documentaries with his family during his free time.